Life, joy and thanksgiving, such are the words one immediately associates with Fr Alexander Schmemann. They might sound sadly inappropriate in an obituary, just as his untimely death at the age of 62 from cancer appears tragic in the light of his tremendous vitality and his great love of life in all its manifestations. His book For the Life of the World (later republished as Sacraments and Orthodoxy and The World as Sacrament) is his answer to a question that could only be asked by someone endowed with a rare sense of the fullness of life. One eats and drinks, one fights for freedom and justice in order to be alive, to have the fullness of life. But what is it? What is the life of life itself? What is the content of life eternal? Fr Alexander was possessed with an extraordinarily clear direct perception of the answer to this most fundamental of all questions, and this was based on his vision of the sacramental nature of the world. All that exists is Gods gift to man, to make mans life communion with God. It is divine love, made food, made life for man. God blesses everything He creates and, in biblical language, this means that He makes all creation the sign and the means of His presence and wisdom, love and revelation. O taste and see how good the Lord is. [. . .] The only natural reaction of man is to bless God in return, to thank Him, to see the world as God sees it - and in this act of gratitude and adoration - to know, name and possess the world. That is why Fr Alexander lived and loved life to the full, with joy and thanksgiving, and it was this abundance of life that he wanted to share, to bring to others. He was a true teacher because he had a vision. Fr Alexander was born in Revel, Estonia, into a Russian émigré family in 1921. When he was seven years old the family moved to Paris, to share in the life of the large Russian community there. Never having been to Russia himself, and refusing on principle ever to go there under the communist regime, Fr Alexander nonetheless always felt himself first and foremost a Russian, with a deep and sincere love for his country, an unreserved detestation of the communist regime, and an unquenchable optimism about its spiritual regeneration. The emergence of Solzhenitsyn from under the rubble was for him a moment of great joy, for he saw in him the confirmation of Russias rebirth. For many years he wrote and broadcast weekly sermons on Radio Liberty to the Soviet Union. He loved Russian literature. I reread Anna Karenina every summer, he once told me. He loved Russian poetry, especially the works of Blok (on whom he once considered writing a book), Akhmatova and Mandelshtam. He considered Mandelshtam to be one of the greatest of Russian poets. In Paris he attended first the Russian Cadet school, and later transferred to the Lycée. He attended church at the St Alexander Nevsky cathedral on the rue Daru, and served in the sanctuary under Metropolitan Evlogii. No doubt it was at this time that he began to love the solemnity, dignity and mystery of Orthodox worship. Already by the age of fifteen he had heard Fr Sergius Bulgakov preach and lecture, and with the beginning of the war entered St Sergius Theological Academy, where he was to stay for the next twelve years, first as a student and later as a lecturer. Conditions during and after the war were abysmal, and the students and staff were frequently cold and hungry. But the teaching was of the highest order, and the teachers among the finest the Orthodox world had known for many years. There was Fr Sergius Bulgakov, whom Fr Alexander deeply loved and admired, although never sharing in his sophiological speculations; there was also Professor A.V. Kartashev, who inspired him with his first love of church history, and supervised him in his masters degree thesis on Byzantine theocracy, as also in his research into the Council of Florence and St Mark of Ephesus. Later, already in the United States, Schmemann was to complete and publish (1954) his Historical Path of Eastern Orthodoxy, which he had started in Paris. Among his other teachers was Fr Cyprian Kern who, as well as introducing him to the idea of liturgical theology, was his spiritual father: and it was in Fr Cyprians parish church of Clamart that Fr Alexander was to serve after his ordination. 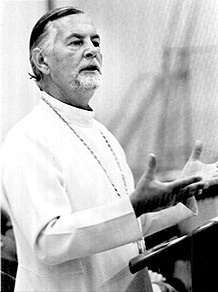 Fr N. Afanasev was another teacher to whom Fr Alexander always felt a debt of gratitude for his application of a eucharistic approach to theology. In addition to his Orthodox teachers, Fr Alexander was also indebted to the entire spiritual and liturgical revival that was so widespread in the West at the time and to the leading exponents of the liturgical movement such as Odo Casel, Lambert Beauduin, Jungmann, Bouyer, Guardini and others. This was typical of his broadmindedness, for he welcomed the truth wherever it was to be found, and admired many outside the Orthodox world. He himself was widely respected throughout Christendom. One need only mention the endless honorary degrees that were bestowed upon him by leading theological schools and universities throughout the United States. In 1945 he married Juliana Ossorguine, at that time a student at the Sorbonne, who was to bear him three children. The following year he was ordained to the priesthood by Archbishop Vladimir Tikhonitskii, the head of the Russian Exarchate in Western Europe under the jurisdiction of the Patriarchate of Constantinople. As well as carrying out his pastoral duties in the Russian parish in Clamart, Fr Alexander continued to teach church history at the academy. His interest in the subject was not purely academic, but derived from a burning desire to understand the Church in its present, a present that in the conditions of the diaspora appeared sadly at odds with the essential ecclesiological unity of the Church. However, he did find that the Church, for all its weaknesses, was alive and expressed itself most fully in its worship. This together with the eucharistic ecclesiology of Afanasev, and the influence of the Western liturgical movement were to determine once and for all his future orientation. Various factors combined to bring about his decision to leave France for the United States. A certain frustration with the confused situation of the Church in Europe, the hopes of realising a more consistent vision of the Church, the need for theologians in America and his own need for a larger and freer arena in which to work may all have contributed. The decisive factor was the departure of another teacher, Fr George Florovsky to the United States in 1949, to become dean of St Vladimirs Seminary in New York. Two years later, Fr Alexander moved there with his family to join him. This move marks the beginning of the second and most brilliant period of his life. St Vladimirs Seminary was at that time housed in cramped quarters in an apartment in New York city, near Columbia University. Fr George Florovsky retired in 1955, and only after the Seminary moved to its new site in Crestwood (New York) in 1962 did Fr Alexander become dean, a post which he held for twenty one years, until his death. During his thirty one years in the United States, Fr Alexanders main achievements can be seen in three fields: as teacher and theologian, as dean of the Seminary, and as ecclesiastical administrator. These various fields are not in any way unrelated, for they were all a part of his realising his vision of the Church, which was to grow in strength and depth to a very large extent due to his labours. As a teacher at the seminary he taught in three areas: early church history, liturgical theology and pastoral theology. His natural gift for languages, his skill with words and the brilliance of his delivery made him a natural orator. His lectures were guaranteed to make one sit up and listen. The delivery, generously sprinkled with humour and wit, was matched by the extraordinary clarity and vividness of what he was saying. He would gleefully destroy old idols and shibboleths, and put in their place a consistent, lucid and rational vision. He was able to convey his own feeling of awe and mystery and an intense love for his subject. Much of what he taught may be found in his many books and articles. He wrote on a wide variety of subjects, and his reactions to contemporary events in the Christian world are fascinating to read. He also wrote on Russian thought and literature. But above all he wrote about the matter dearest to his heart, liturgical theology, the meaning of worship, the sacramental life of the Church. Of Water and the Spirit, An Introduction to Liturgical Theology, Sacraments and Orthodoxy, Great Lent and his final work, due to be published soon, on the Eucharist. This is neither the time nor the place, nor is it within my capability to sum up the contribution Fr Alexander has made to Orthodox theology. Suffice it to say that he has demonstrated to an Orthodox world that for a long time had taken its magnificent liturgical tradition for granted, that the most faithful, the most consistent and most clearly accessible expression of its faith was to be found in its liturgical life, and that it is this liturgy, this worship that reveals to man the real purpose of his existence. As dean Fr Alexander was indefatigable. St Vladimirs Seminary, although not his creation, in its present form and on its present site is certainly to a large extent the result of his efforts. Widely regarded as one of the best theological schools in the Orthodox world, it counts among its alumni a great number of priests, several bishops and theologians, from many parts of the world. Many of these carry the vision instilled in them by their dean. He was instrumental in gradually moving away from an ethnic view of Orthodoxy, and he was proud that the seminary not only carried out all its services and teaching in English, but also catered for students from a variety of ethnic and convert backgrounds. Almost from the time of his arrival in the United States, Fr Alexander became involved with the ecclesiastical administration of the Russian Orthodox Metropolia in America as it was then known. His greatest achievement in this field came with the granting of autocephaly to the Orthodox Church in America by the Patriarch of Moscow in 1970. This move was not without its critics, and to this day is not accepted by all. For Fr Alexander, the many years of negotiations, preparation, and the achievement of autocephaly were all steps in the creation of a truly united, single Orthodox Church in America. In the preface to the Russian edition of his Introduction to Liturgical Theology, Fr Alexander refers to himself as a Russian émigré boy [. . .] who was for life captivated by the mystical beautiful world of divine worship. Divine worship, and above all the Eucharist, the Divine Liturgy, were at the core of his being. He celebrated with calm dignity and beauty. At the end of the anaphoral prayer he would prostrate himself before the Holy Table with the words Maran-atha (come Lord!) as a confirmation of the truly eschatological dimension of what had come to pass. In the light of the Eucharist we see that Christ is indeed the life and light of all that exists, and the glory that fills heaven and earth. There is nothing else to remember, nothing else to be thankful for, because in Him everything finds its being, its end. Whilst visiting the United States this summer, I spent an afternoon at St Vladimirs Seminary, where I was a student some twenty years ago. The place was almost deserted, most of the staff were on holiday, and there was a strange stillness in the air. At the same time I felt a deeper sense of emptiness, of sadness, for I knew that Fr Alexander was no longer there, that one of the greatest Orthodox theologians had left this life. In the bookshop a small table with copies of his books on it seemed to be the only tangible reminder of his presence. When I entered the newly built seminary chapel, completed so shortly before his death, and in which he had lain, I was suddenly and forcefully reminded of a far more enduring memorial. Behind the Holy Table, an icon painter was painting a large fresco of the Last Supper on the east wall. The Eucharist had always stood at the centre of his life, and it was at the Eucharist that he had partaken of Life eternal. Now he is the more fully a partaker of the divine life of Christ, in whom everything finds its being, its life, its end.